The STEPCRAFT-2 840 is the largest model in the STEPCRAFT-2 product line. With a work area of 840mm (33″) x 600mm (23.5″), the 840 is the perfect machine for woodworking, large hobby model projects, large craft projects and much more. As with all STEPCRAFT machines, you have the ability to quickly interchange attachments so you can go from milling to 3D printing, engraving to craft cutting and much more in seconds. STEPCRAFT is the MOST UNIVERSAL machine on the market with a very competitive price. 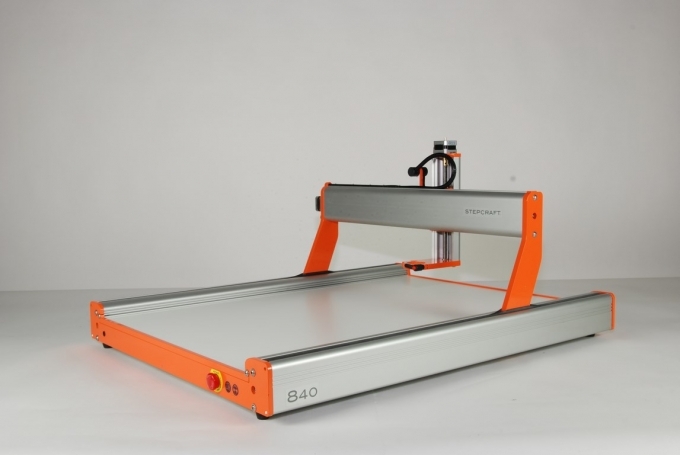 STEPCRAFT machines feature true German design, innovation, precision and craftsmanship. Become an Expert and let’s see WHAT WILL YOU CREATE? Highly accurate, thanks to high quality, precision components that are matched and test fit at the factory. Integrated control electronics in the machine housing. Only requires a power supply cable and USB cable to the computer – no wiring clutter. NOTE: The machine DOES NOT COME with a spindle, or other accessories. It includes the machine itself and UCCNC machine control software. All other options and accessories are available on the website. Click the button below to add the STEPCRAFT-2/840 Construction Kit to your wish list.